Really feeling like doing a tag, the beauty blogger tag is one of my favourite to read at the moment. It's great way to find out a little more about another person. To be honest I always had a blog, I was around 13 years old when I started my first blog. It was more of an diary, then I moved on to graphic. You can actually have a look at one of my blogs here, it's written in Polish but you can view some of my work. The whole layout had been created by me. Then in 2010 I had discovered "beauty blogging". I always had passion for beauty, but no one to share it with and here I am today. I had first discovered Lily's blog and from that point everything had moved onto a different level. What was the first blogsphere hyped about product you bought and was it worth the hype? Urban Decay Naked palette? I'm not sure, but that was one of the first make-up product I bought after seeing it on blogs. I must say that I love it, now I have both palettes and I still use them on daily basic. What are your favourite five things about blogging and being a beauty blogger? 1. The people I had chance to meet, that's the most amazing part of blogging. I love meeting new people and it's even better when you have the same passion. 3. Taking photos for my posts. I just love doing that. That being honest is the most important thing. Have you changed anything since being a beauty blogger? Personality wise? Not really. Blogging wise, I had changed a lot. Now I do my research before actually buying a certain products, I'm not really falling for the hyped up products. I stopped "collecting" products, now whenever I use up something, I will buy something new. Just be yourself, everyone will love you for your personality. Don't turn a copy of someone else. I would also recommend to be active, by this I mean work on your relationship with your readers. Urban Decay, Tresemme, Origins, Estee Lauder, MAC. Laura Mercier Mineral Powder Foundation, the best foundation for lazy days. OPI nail envy, that's my life saver. My nails always had been weak, but now the state of my nails is so much better than before. Bioderma best product to remove make-up. Urban Decay Naked Palette, I love using it on daily basic. The colours are great for day and night looks. Origins Super Spot Remover best products to help spots heal faster. I tag everyone. If you feel like doing this text go ahead, let me know. I would love to read it. Everyone seems to be mentioning Nail Envy among their favorites. I need to try it myself since my nails are very week. 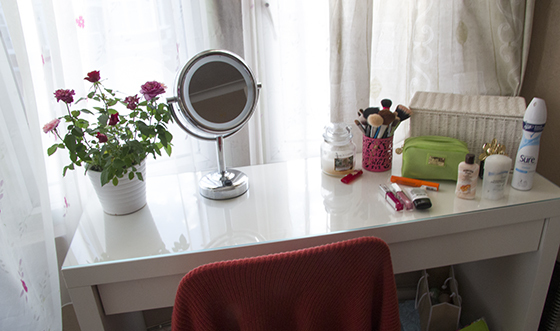 Your makeup set up looks lovely!